Like us, our feline companions prefer to eat and drink from nice, clean dishes. But finding the right food bowl for your cat isn’t a simple matter of picking the best-looking or cheapest cat dish. To make mealtimes a pleasure for your pet, it’s important to get a food bowl that is just right: it should be slightly elevated to promote healthy digestion, sturdy and durable so your cat cannot make a mess every time they eat, and of course, it should be cute too to compliment your interior. To help you find the right cat food feeder, we’ve reviewed and tested dozens of different pet bowls. The result? A list of 15 best food bowls for cats currently on the market. We’ve also put together a comprehensive buying guide that contains everything you need to know about cat food bowls, as well as how to pick the right one for your pet. 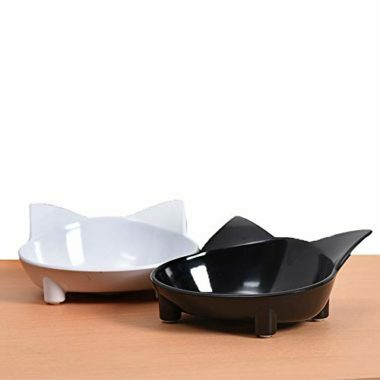 Elevated, cute and made of ceramic, Neocoichi is without a doubt one of the best food bowls for cats. Because it’s raised higher than conventional cat food dishes, it provides maximum comfort when eating, plus it promotes digestion. It’s perfect for aging cats, as they don’t have to bend down to eat, but it’s also ideal for healthy adult felines as it fits just the right amount of food, offering the perfect serving size. Importantly, the bowl is built in a way that makes whatever food is left inside stay centered. So, no more chasing the food around the dish and making a mess or tiring those long whiskers. The base is also very wide, making the entire dish perfectly stable, further preventing food spillage. The Necoichi raised cat bowl is both dishwasher and microwave safe, so you can say goodbye to manual washing, and your kitty to cold food. If convenience is what you’re looking for, give Urpower double pet bowl a try. 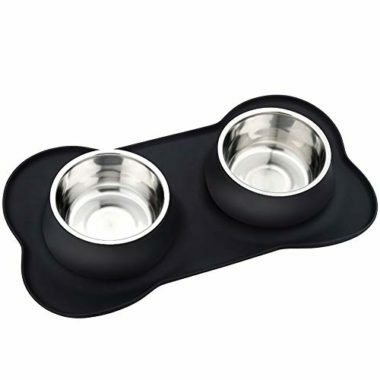 With a silicone stand that prevents skidding on the floor, and two stainless steel bowls that you can either use as food plus water dishes, or food bowls for two different cats, this pet product is the definition of convenience. Both dishes are made of stainless steel and fit 26.46 of ounces. You can easily remove both when it’s time to wash them and chuck them in the dishwasher as they’re rust-resistant. In fact, even the silicone mat is dishwasher-safe, making the whole process of cleaning after your pet a piece of cake. The Urpower double pet bowls are perfect for both adult cats and kittens, as the silicone is raised just slightly. You can also use them for dogs, as the dishes fit more food than your typical cat bowls. Beautiful, sturdy and convenient, the elevated pet dish by Pawfect is a great choice for all pet parents who wish their cats the best. 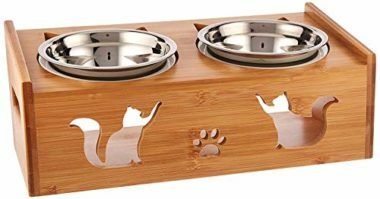 Thanks to a strong, wooden stand made from bamboo, this pet feeder is elevated to promote healthy digestion and reduce bloating and provide comfort while eating for aging cats. 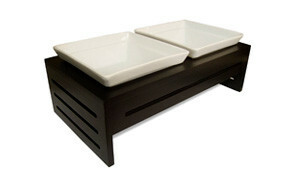 The stand has silicone rings that keep the dishes securely in place, preventing them from clanking or leaking through. As for food spillage, whatever your cat manages to spill out of the dish will get caught by the base which is easy to clean. Speaking of dishes, there are two of them, both made of stainless steel. This means they’re easy to keep clean and hygienic, as they’re dishwasher safe. To provide maximum convenience, the Pawfect Pets provide not only one set of 1.5 cup capacity bowls, but an extra one with 2.5 cup capacity. Compact, handy and slightly elevated, the cat feeder by Neater Feeder is a good choice for messy eaters. 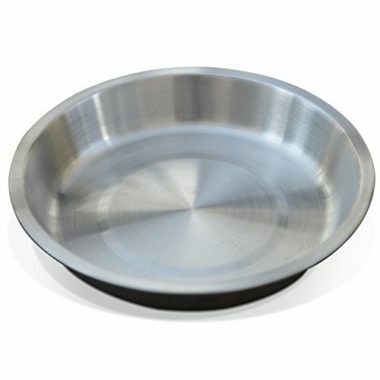 The feeder comes with two stainless steel bowls, plus a sturdy plastic stand with a catch basin. Thanks to the unique design of the feeder, whatever your cat spills will be contained within, so you can quickly and easily clean up any messes. The feeding height is 2.75” from the floor, so pretty much any cat can use it. Adult felines, seniors with joint problems and even kittens should have no problem eating from this dish. Because there are two bowls (of 1 cup capacity), you can serve both food and water at the same time, or use the feeder for two cats. The two bowls are dishwasher safe, and although the manufacturer claims that the stand is too, we’d wash it manually to avoid chipping. If you’re looking for the best-looking pet feeder, we may have just found it for you. 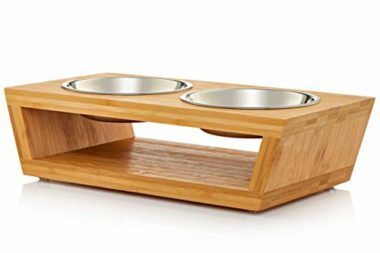 With a beautiful wooden base and two elegant pet food bowls, the ProsperDog Pet Products feeder compliments any home décor. While the name of the brand may suggest this is a dog feeder, it can certainly be used for cats too; in fact, because it’s quite small, we’d say it’s best suited for cats and small-breed puppers. The simple and elevated stand improves your cat’s neck angle while eating, making it a great choice for older or injured cats. The base also has a non-skid bottom, preventing the feeder from sliding around on the floor. As for cat bowls, they’re made from ceramic, with a wide opening to prevent whisker fatigue. Both dishes have a 2 cup capacity and are dishwasher safe. Although the manufacturer doesn’t state so, being that they’re made from ceramic and are lead free, the bowls should be microwave safe too. Another beautiful, raised pet feeder that is best suited for aging cats, cats with arthritis and neck pains. The Foreyy pet feeder consists of a wooden stand with high water resistance properties, and two stainless steel bowls. The stand, which is made from bamboo, has anti-slip feet that make it perfectly stable and pretty much impossible to move around the floor. This means no scratches or skid marks on your wooden floor or tiles, plus less mess as your cat will be unable to knock the feeder over. There are also two bowl insets which provide additional stability. Speaking of the dishes, both bowls are of the same size, and since they're made of quality stainless steel, both are also dishwasher safe. The Ferrey pet feeder comes in several different sizes, but the smallest one should suit most cats. If your cat suffers from whisker fatigue, it’s crucial to get them a wide and shallow enough food bowl that doesn’t require pulling back the whiskers when eating. Dr. Catsby bowl is perfect for this. 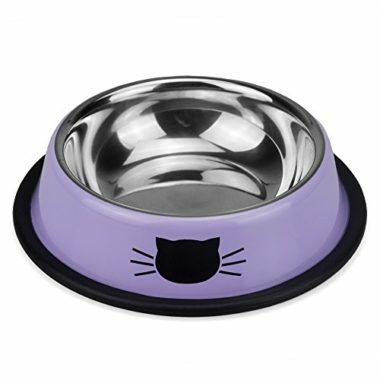 Made of premium stainless steel, without sidewalls or corners, this wide and shallow cat dish not only provides stress-free eating, but truly an enjoyable dining experience. 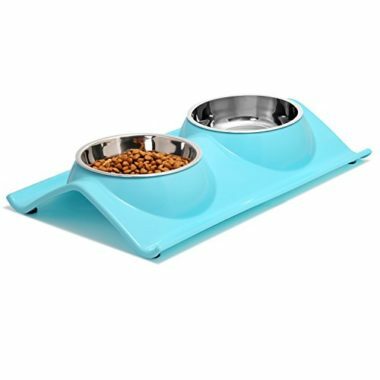 The shape of the bowl, as well as the detachable anti-skid place mat, also help keep the dish stable and food in center, so your kitty doesn’t have to chase it around the dish. As the manufacturer claims, this bowl, being that it’s made from food-grade, premium stainless steel, also helps with chin acne prevention as your cat doesn’t have to rub it on the food and bowl while eating. 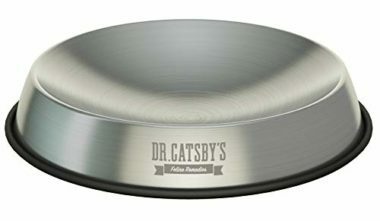 Dr. Catsby bowl is dishwasher safe. Elegant and minimalist in look, this highly convenient cat feeder by Mushroom Cat is perfect for pet parents who like cute and functional pet feeders, as well as cats who like their food and water in one place. The MushroomCat consists of two ceramic cat bowls plus an iron bracket that keeps them locked in one place. The bowls are made of high-grade ceramic and contain no toxic chemicals, so not only are they dishwasher safe, but microwave safe too. They’re also highly durable, without any sharp edges or corners, making the eating process easy for your kitty. The bracket is raised, helping keep your cat’s neck in a proper position, plus it’s on the heavy side, so pretty much impossible to flip over. The bowl bodies come with interesting designs, so you can easily find the ones that compliment your interior the best. 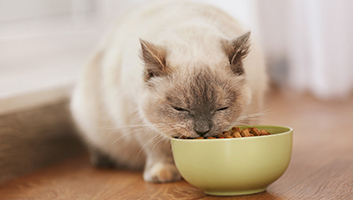 Does your cat gulp food and as a result has digestive issues? Maybe they’re overweight? If so, give the Norhmate Interactive feeder by The Company of Animals a try. This uniquely designed and built product is a great way to turn your cat’s meals into fun, challenging games that slow down eating and stimulate their natural instincts. 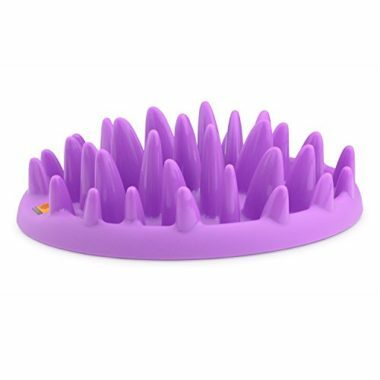 Mad of safe plastic (no phthalates), with smooth spikes, this feeder will not only help your pet eat slower, promoting better digestion, but will alleviate boredom while doing so. So how do you use this? Just scatter some food across the feeder (catch) and let your cat push or grab it in order to eat. The game will prolong your kitty’s eating time, make them healthier and happier. The feeder is suited for both wet and dry cat foods and can be washed in a dishwasher. Cute and affordable, the Lorde cat bowls are wide and shallow angled, preventing whisker fatigue. Made of BPA-free, non-toxic plastic, these cat food and water bowls hold 8 ounces of food/liquid to prevent over-feeding and promote healthy weight and digestion. Although they’re pretty simple in design, the dishes are quite durable and convenient. On the bottom, there are four anti-slip silicone legs that should prevent your pet from sliding it across the floor. And since they’re small and adorable looking, it’s very easy to fit them into any corner of the house. Made of durable plastic, the Lorde cat bowls can be hand washed or tossed in a dishwasher, but should never be microwaved. Simple and functional, the Upsky Double pet bowls are a good choice for cats who prefer or are able to eat only from elevated feeders. There are two stainless steel bowls with a unique resin bottom, making them easy to hand clean or toss in the dishwasher. The stand is made of plastic and is elevated to prevent improper neck position, plus it's built to catch any food spills that you can later clean up quickly and easily. To hold the dishes stable and in place, the stand has two rims that prevent your cat from turning them over. 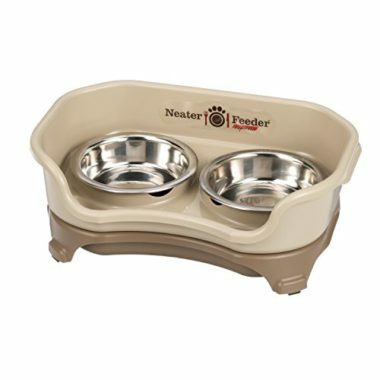 Since there are two bowls, you can use them for food and water for one pet, or as food bowls for two of your pets. Both dishes have 11 ounce capacity. If you’re looking for a durable, old-school cat food bowl that aids in whisker fatigue prevention, you’ve found it. The PetFusion bowl is made from premium stainless steel with a brushed finish and wide and shallow dimensions to prevent whisker fatigue. 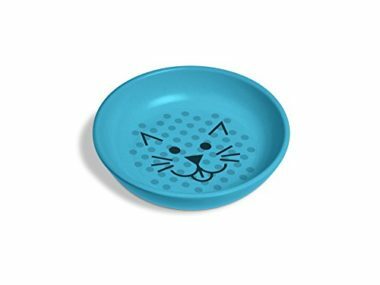 Using this simple but beautiful quality dish, your kitty won’t have to pull back their whiskers in order to eat – the dish is wide and shallow enough for your cat to comfortably eat, but still big enough to hold enough food. The bowl also has an extended outer rim for easy lifting and cleaning, and since it’s made of high-grade stainless steel material, it’s dishwasher safe. This is one of the most corrosion-resistant cat bowls out there, that is also super-strong and practically unbreakable. The Lapet elevated pet feeder is not only one of the cutest feeders we've managed to find, but also one of the most durable and convenient ones. 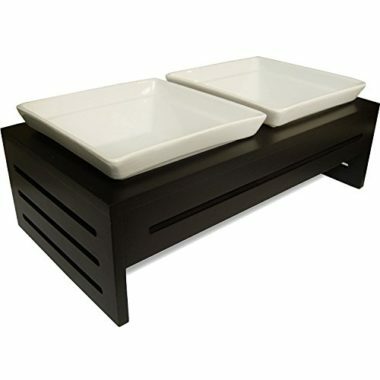 The feeder consists of two ceramic bowls that are both dishwasher and microwave safe, and a wooden stand with polished handles at both sides for easy moving. The base is elevated to promote digestive health and proper neck position, so it’s perfect for senior cats and felines with tummy issues. Importantly, the bamboo stand prevents mold and mildew from forming underneath the dishes, as it’s open, allowing air to freely circulate. Since the entire feeder (stand + ceramic bowls) is on the heavy side, it's almost impossible for a cat to knock it over and make a mess. Looking for cute, high-quality food dishes for your feline friend? The Ureverbasic cat bowls fit the bill. Made of premium stainless steel, with adorable designs and vibrant colors, these little dishes can hold up to 8-ounce (1 cup) of food and water, so are perfect for tight spaces. The dishes are polished and have excellent anti-corrosion and anti-rust properties, making them great for both easy hand washing, as well as dishwashers. 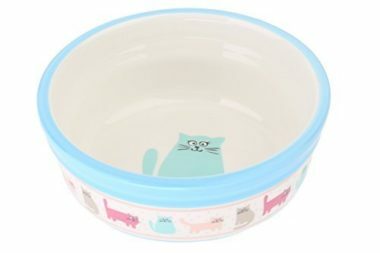 Because they don’t fit too much food, these bowls are ideal for overweight cats who need smaller meals, although you can, of course, use them for healthy-weight cats too. 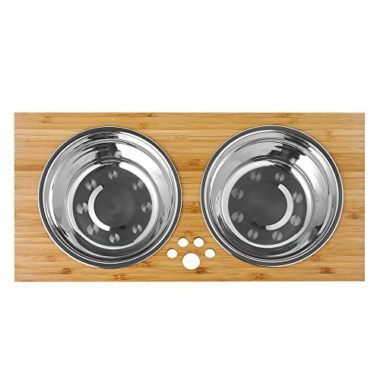 Both dishes come with anti-skid rubber around the bottom, so your pet won’t be able to slide them over the floor. When using a dishwasher to clean them, you need to remove the anti-skid rubber. If you’re on a tight budget but still want a quality food dish for your cat, definitely check out Van Ness Ecoware bowl. Made from bamboo and other plant materials, this dish is not only biodegradable, but perfectly safe for all pets. It’s also highly durable – practically unbreakable, with fantastic anti-chip and anti-crack properties, this little dish is guaranteed to last a very long time. 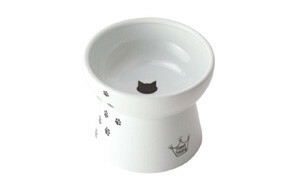 The bowl is designed to prevent whisker fatigue, as it’s shallow and wide. It’s also high-polished and therefore easy to hand clean. 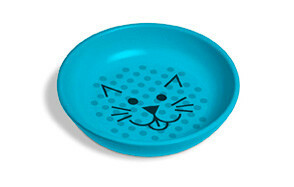 The bowl has a kitchen-grade silicone anti-skid bottom, so your kitty won’t be able to move it around and make a mess. Although not specifically marketed as dishwasher safe, many pet parents do put the bowl in the dishwasher – generally, if you want the dish to last a long time, it’s better to hand clean it, but occasional dishwashing shouldn’t damage it either. Most cats, especially the finicky eaters, like to eat from nice, clean bowls. But how to find a quality cat dish that both you and your pet like without breaking the bank? Should you do go for elevated cat bowls, wide and shallow ones for whisker fatigue, stainless steel materials or maybe plastic dishes? With so many different options on the market, it’s no wonder why many pet parents could use help in picking quality pet bowls! Luckily, you’ve come to the right place. In this buying guide, we talk about everything you need to know about pet dishes, including how to spot the best food bowls for cats in the sea of feline products. No matter the build or design materials, a pet bowl needs to be safe, first and foremost. What do we mean by this? The materials used should never contain anything toxic and the design should be such that your cat cannot chip a bowl and swallow a piece or get cut on it. Whether stainless steel, ceramic or plastic, a cat food bowl should be durable and stable. You should be able to wash the dish every single day and still have it nice and non-chipped/non-faded for a solid year, or longer. Generally, stainless steel and ceramic bowls tend to last longer than plastic ones, although they’re pricier as well. A cat dish should be easy to lift, move and clean. Ideally, you want a product that is both sturdy and stable so your cat cannot turn it over or slide it across the floor, but also lightweight enough so you can easily lift and move it (may be especially important for senior citizens). Also, whether you hand clean or use a dishwasher, look for bowls that are easy to clean (non-stick surfaces). Food bowls for cats made of plastic are not bad per se – they’re lightweight, usually come in a variety of colors and designs, plus they’re more affordable than ceramic and stainless steel ones. However, they’re not ideal either. For one, plastic is not good for the environment, and two, it’s possible for some cats to have an allergy to plastic. If you’re wondering what this condition looks like, it involves a skin condition that resembles acne (usually develops on the chin). That all being said, if you have a limited budget and your cat’s been eating out of a plastic bowl for most of their life and is perfectly healthy, it’s fine to continue purchasing plastic food bowls. There are literally thousands of different cat bowls currently on the market. But when it comes down to it, you could group all feeders into three different categories: old-school pet bowls, raised bowls and automatic feeders. Let’s talk about each type in a little more detail so you can decide which one is best suited for your pet. Old-School Pet Bowls: made of stainless steel, ceramic or even wood, old-school pet bowls are simple but functional. Usually, these dishes don’t have a special design such as a raised stand or a super-cute shape, but they serve their purpose. However, today, a lot of old-school bowls will have a silicone non-skid bottom, which prevents your kitty from sliding it over the floor. Still, not every dish has non-skid legs/bottoms, so if your cat is generally playful or mischievous, pay special attention to this detail. Raised Pet Bowls: made to support a proper neck position while eating, as well as to promote healthy digestion, pet bowls with elevated stands are some of the most popular food dishes today. A bowl will either be one-piece with an elevated base, or have a separate stand made of wood, steel, plastic or any other material. Generally speaking, it’s best to go for at least slightly elevated cat bowls as studies have shown that they aid in digestion. This is not a must, but it’s something to keep in mind if your cat suffers from stomach issues or is old and struggles with neck pain and arthritis. Automatic feeders: if you’re often away from home and don’t have anyone to feed your cat, your best option is an automatic feeder. Although quite expensive, these machines can be programmed over several days to feed your cat at the same time they normally eat. You can also control the portions which can be highly beneficial for overweight cats. Of course, this is just a rough categorization; there are numerous cat food bowls out there, some made of plastic, some of ceramic, stainless steel, even glass. There are also wide and shallow vs narrow and deep bowls, as well as interactive feeders, all of which serve a different purpose. What’s important to remember is that there is no “the best” food bowl out there (a bowl that will suit every single cat’s needs), but there probably is the best food bowl for your cat. To keep your kitty happy and healthy, it’s crucial to clean their food dish regularly. You want to clean the bowl every single day to get rid of any bacteria, dirt and dust. If you’re really concerned about your kitty’s health, wash the bowl after every meal. However, how to properly clean your cat’s food dish will depend on two things: the bowl’s build materials and its design. All cat dishes can be washed by hand: all you have to do is use regular dish soap and warm water, scrubbing a little where needed. If your food bowl has vibrant colors or applications on the outer side, be careful not to scrub too hard as you could remove it. Some cat bowls can be washed in a dishwasher: most ceramic and stainless steel bowls, as well as some plastic bowls, can be tossed in a dishwasher daily, although it’s always a good idea to check it your specific bowl is dishwasher safe. Speaking of stainless steel and plastic, it’s worth remembering you should never microwave them. Q: Where should I place my cat’s food bowl? A: Wherever your cat usually eats is fine. If you have a kitten that doesn’t have a regular dining spot, this is the ideal time to teach it to eat where it’s convenient for you. Ideally, you want to place the food bowl in a quiet, open space, so your cat can feel safe and calm during every mealtime. Q: Can cats share food bowls? A: It’s best to feed your multiple feline pets separately. Cats are territorial creatures and prefer eating on their own, plus different pets have different preferences. However, if you get a raised feeder with two bowls, it’s perfectly fine to feed your pets at the same time, on the same feeder. As long as each cat has their own dish, they won’t mind. Q: Are elevated bowls better for my cat? A: Generally speaking, because elevated bowls are better for cat’s digestion and posture while eating, they’re considered to be the best food bowls for cats. However, if your kitty has been eating out of a regular food bowl for a long time and doesn’t seem to mind it, there’s no need to switch to raised food bowls. That said, aging and senior cats should use elevated feeders. 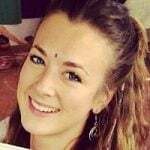 Q: Do I need a mat? A: Although a mat can be highly useful as it catches spills and messes, it’s not a must-have. If your pet is a messy eater and you feed them inside the house, it is better to invest either in a convenient, wide mat or a feeder that comes with a wide stand/mat that catches spills on its own. While all 15 products we reviewed are quality food dishes, the Necoichi Raised Cat Food Bowl takes the crown. Elevated, with a perfect holding capacity (1 cup), this dish provides maximum comfort at mealtimes, while promoting healthier digestion. 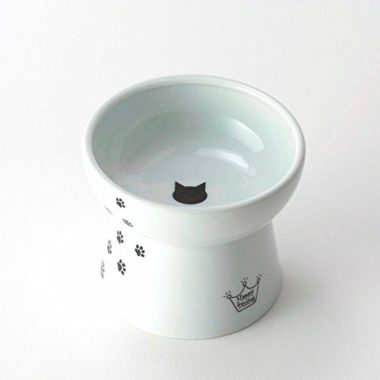 Because it’s made of high-quality ceramic, the bowl is not only dishwasher safe, but microwave safe too, meaning you can heat up your cat’s meals whenever you (or your kitty!) feel like it. Importantly, the dish is designed to keep the food centered so there is less stress from chasing it around the bowl, which can help reduce whisker fatigue. Finally, thanks to a subtle inner liner, there are practically no spills with this dish, making it one of the best food bowls for cats on the market.